“Vintage Style Outdoor String Lights & Giveaway” is sponsored by nostalgicbulbs.com, and all opinions and ideas are honest and mine (the redhead). Two sets of 24 lights were delivered quickly, and this box was packed in with another box, inside yet another box. So, yes, they were packed very securely. I couldn’t wait to get my paws on them, so I opened them immediately even though I knew I couldn’t put them up until I got home from vacation. The vintage glass light bulbs were packed in their own box and you may notice there are 12 extra just in case. What a deal. That is a lot of extra bulbs. So, we got back from vacation and I was all set to put them up with my husband on the weekend. Well, wouldn’t you know, it rained all weekend so my plans were postponed. The suspense was driving me crazy, so I actually considered hanging the lights inside. The only thing that stopped me (these are meant for indoor also by the way) was that I knew how beautiful they would look hung on our deck. I just felt it in my bones, ya know? In fact, you may have noticed that I completely forgot to light my little green tiki torch in the flower urn. What can I say? I had no need to. Even after the sun went down it still felt very “lit up” and would be perfect for any outdoor gathering, or romantic night. Right after the sun went down, I ran inside the house and snapped this shot of the entire deck from our side porch. Earlier in the day I snapped a few more angles of the lights so you could really get a good idea of how we installed these. It was actually quite simple because the lights come equipped with a built-in hole above each bulb where you can screw or nail them into the wood. We were both completely comfortable nailing ours into the wood deck knowing that if we ever wanted to remove them, a little white patching would take minutes. Not only was our “lower undermount installation method” easier than installing something to the deck to hang them overhead, but I don’t have to worry about them when the winds pick up. They are very secure here and light up the deck beautifully with this undermount installation method. Whoops, my clock is wrong, and my chives need harvesting 8-O. TIP: Hang the string of lights without the bulbs first. Then once you’re happy with the placement, screw in your light bulbs. This next photo really shows how durable the wire is and how easy it was to manipulate around the corners. This took us literally minutes. Now I just need to invite some friends over for a party. I’ve been craving fresh crab lately, doesn’t that sound good? This giveaway is for US residents only and you must be 18 years of age or older to participate. Giveaway runs from Wednesday, July 19 6:00 am EST through July 26th at 12:00 noon EST. Winner will be chosen randomly and notified by e-mail. 1. Visit nostalgicbulbs.com blog HERE to check out all their excellent articles on vintage light bulbs. 2. Leave a comment on my blog post telling me what you would do with your free set of lights. 3. Tell a friend or family member about this giveaway 🙂 . These are beautiful lights that would definitely look awesome hanging on our privacy fence and if the size was right, I would try to use them with our old glass insulators to create unique backyard lighting! I would string the lights in our new backyard. We are new homeowners who have cleaned up a very overgrown back yard. It is becoming charming. Some pretty lights would make it inviting and bbq ready. They look great! 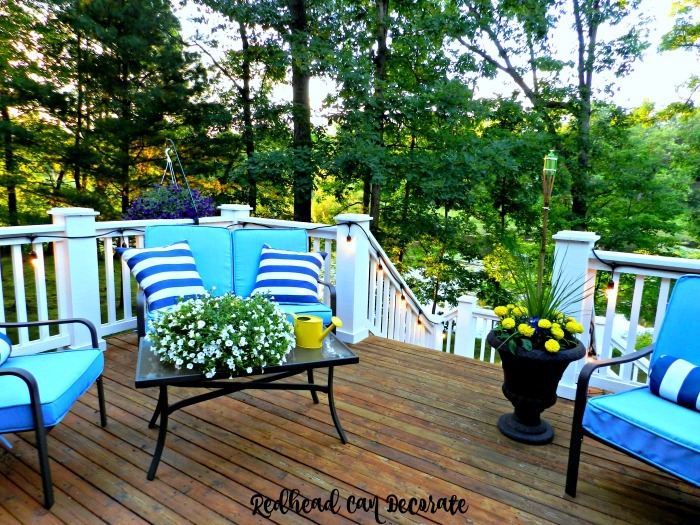 Your deck always looks great, but these added something special! If I had these lights I would put them on the new, floating deck my husband and kids built for Mother’s Day! I am not sure if I’m commenting here on the blog or not? But I have a 1928 Tudor brick home and wondering how these would install on brick, if it would work as well as yours. Thinking they would look lovely on my beautiful front porch! Hi Paula, Yes you can screw into brick with the correct drill bit & screws (we have done it many times inside & out into real brick), but you should learn correct safety measures first. I suggest asking your local hardware store to help with any questions you have. Good luck! Love what you did! If I had a set, I would be torn by two options. One would be to string them along my fence or other option would be to attach it to the house and then make a V to the corners of the patio! Decisions decisions! How cool are these!! We don’t have a deck but I think they would be beautiful in our screened Arizona room. I’m looking at the articles about the bulbs, and I had no idea that some light is detrimental to your health. Just another reason to love edison bulbs!! I have been looking for good quality lights to put on my deck. Thanks for sharing. I would love these on my backyard deck for when the family comes over for bbq’s and fun! By the way.. Your deck is beautiful! And the lights top it off! The lights would look lovely on my gazebo! They look like they’re are made well & easy to install. It’s so funny that I just got this e-mail and I also just got my delivery of my string lights…mine are in a tear drop shape and are solar…I’m going to put them around the frame of my swing…Way to cute! If I had a deck, I would do just as you did with yours! I can’t wait for it to get dark out! Our screened porch would look great with these lights strung on it! I’m planning my daughters graduation and 18th birthday party in Auguest. I would use them to light up the fire pit area! They would look great on my new patio cover. I have wanted to add some and this would get me started. These lights are beautiful! I would string them up on my enclosed back porch. I think they would create such a magical feel. Thanks! I shared on Pinterest! It looks amazing! We also have a deck that these would be perfect for. Right now we have several large, glass candle holders that we use on the deck, stairs and patio near our fire pit. There’s just something about the look of candles and lights that make the evenings feel so romantic. Great job! These lights look so pretty on your deck! I would love to have them on our back patio. How wonderful to actually win a set! I would love to win these. I didn’t get to do a lot of decorating for summer & these would look lovely on my deck even through the Fall. Thanks for the entry. These lights are beautiful and I would love to string some along our newly refinished deck. The cozy feel it creates is stunning for outdoor family times. Thanks so much for sharing your photos and hosting this contest! I would love to win a set of free lights! I would decorate with them in my backyard around my patio area and make it look nostalgic! I would string along our deck that overlooks the river at our Cabin. We have lights up already, but these would be a definite upgrade! Gorgeous. These lights would be great around our deck! They would light up our woods and allow us to use the deck later in the evening! So inviting, looks like something out of Better Homes & Garden. I love the lights on the window flower box. Certainly made a light bulb go off in my head. I can picture these tucked Christmas/winter outdoor arrangements & also hanging from the bare trees. Our backyard is quite dark and I’ve actually gone through several sets of “outdoor” lights. They always seem to break/lines crack. I would love to use these instead of the harsh security lights that are currently my only lighting, at least for when I’m out back trying to enjoy the yard. 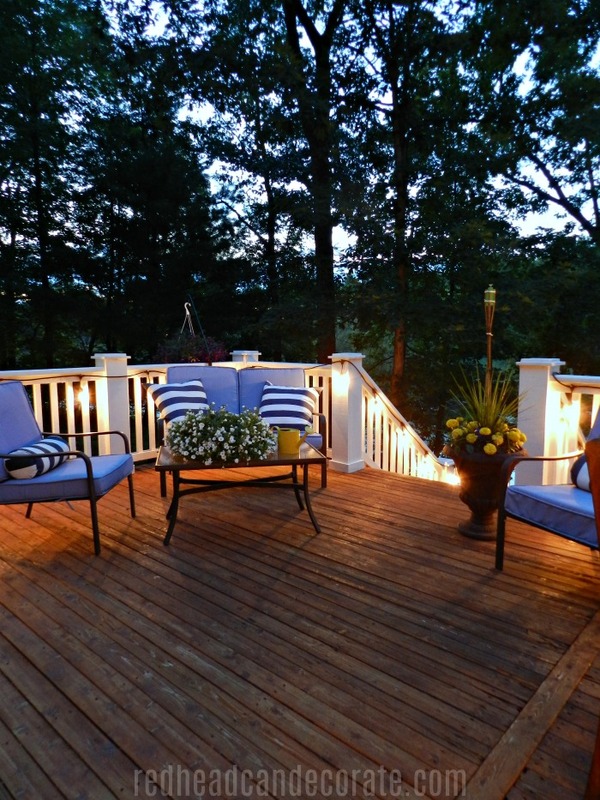 These lights give light your deck beautifully, and give that perfect ambiance. While we have a large deck, and could see these working beautifully on it, I think I would hang them in our gazebo, almost directly off our deck, and pool. We hang there a lot, and these would add the perfect touch of light. Even better, I might just save them and use when we retire in a few years to a coastal community in North Carolina…they would look great in a screened in porch, an go perfectly with a coastal farmhouse vibe. Either or …these are stunning! 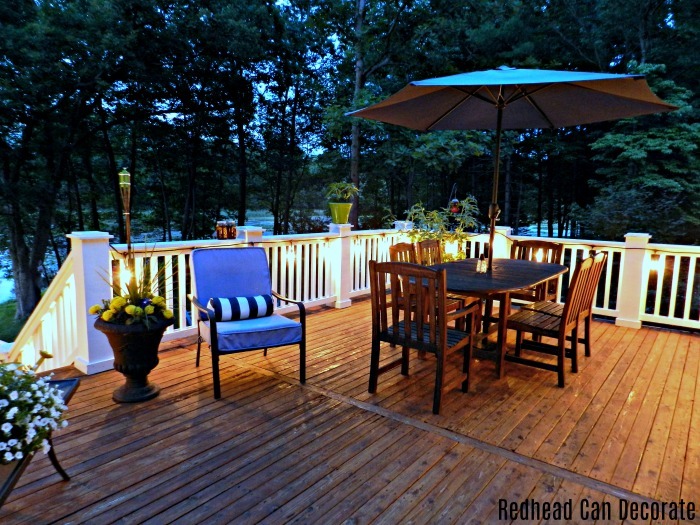 your lights look wonderful on your deck and the deck itself is stunning! i wondered if your window boxes are made of wood (looks like they are), and if so did you line the inside of the box somehow to protect the wood and decrease dripping down on your house after watering? Those lights are great! I think I would hang them on the inside of the gazebo we have on our deck! You live on an amazing location and in a beautiful home. Living in the city doesn’t give me much space to do projects like yours but I do with what I have thanks to all your inspirations and a little bit of mine. You are very blessed for all that you have and so am I even though they are in different proportions. Keep up the great work! I am a retiree who recently decorated my covered porch on a very limited budget($30 for two chairs and $10 for a potting table). These lights would be just the finishing touch I need!! I would totally hang them around my porch like you have! I do not have porch as big or beautiful as yours, but it would make my little one much prettier! These lok awesome on your deck! I have been needing some new lights to string up around the roof of the covered patio…these would actually be perfect! 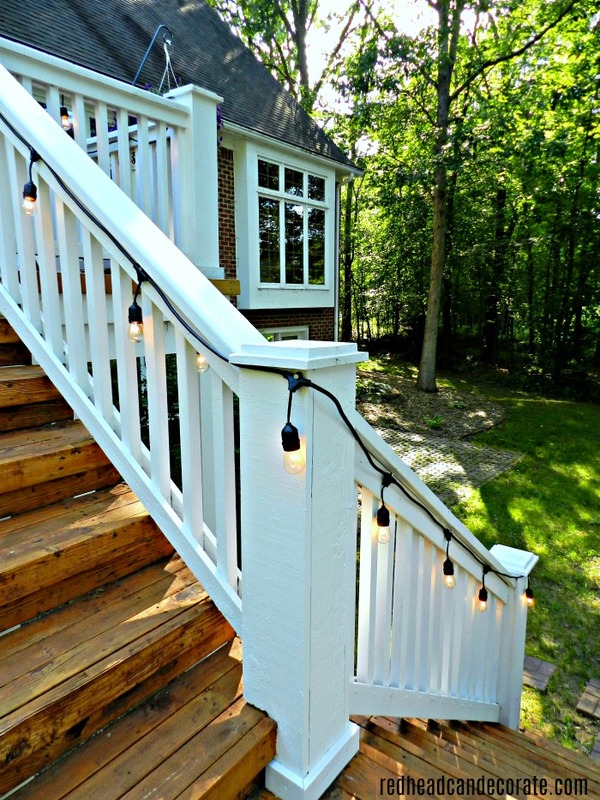 The lights look great on your stair rails and around your deck! I’ve admired these lights for a while but haven’t bit the bullet yet to get them. We’re redoing our back porch and patio (added a pool!) and would love these for our back porch. The lights would look lovely on my lanai! They look like they’re are made well & easy to install. I love the vintage look of these lights! I have a couple of lights in the house with these bulbs and love them. Would love to take this same vintage look out on the deck. Such a cozy look for outdoor gatherings! What gorgeous lighting and such a romantic setting in the evening. I would hang these on my new shed if I should happen to win. Thank You for this great giveaway opportunity. Love these lights! I would string them between our house and my garden shed over the patio in my backyard. Thanks so much for this offer! Hi Redhead Julie. I love the ideas you post for my almost daily. These lights are super cool and because they are vintage they remind me of my deceased grandparents home in Wisconsin. 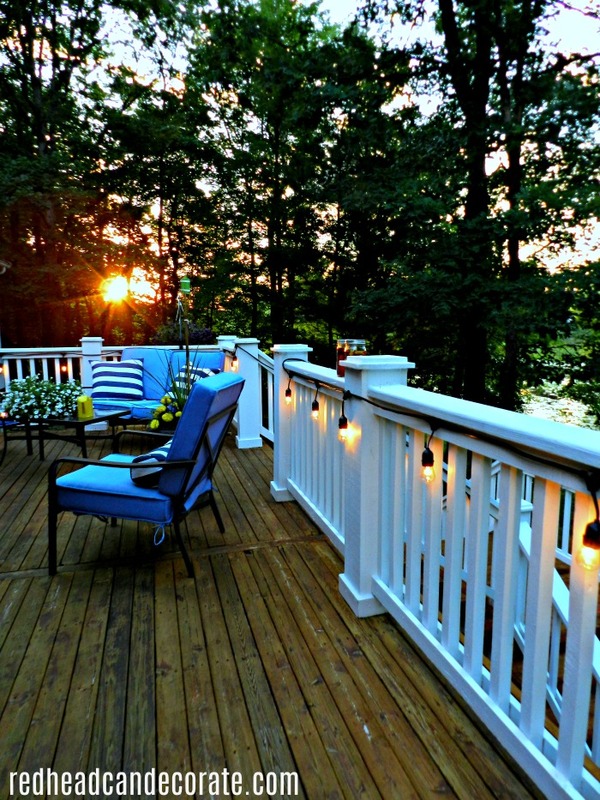 Your deck is beautiful already, and the lights just add that warmth and romance to it. Well done. Kuddos to you and your helpful husband. They look beautiful on your deck. My husband just finished building our new patio & they would look fabulous for evening/night usage. I love how the illuminate your deck area. We finally (after 22 years & the kids are all grown – lol), were able to buy our own home last fall. It has a terrific, large covered patio that our daughter has been itching to put lights around. That’s where these lights would go if we were to win them. A great project for her to do on one of her weekends home from school! These would definitely jazz up my apt patio. It is hard to decorate an apartment patio but I am getting there. I love vintage anything. Pick me please. Fingers crossed. I would put these on my deck for safety lighting just as you have used them . They would make a wonderful decor statement also. These “retro” lights really do make your deck look extra cozy. Thanks for the chance to win a set! If only my deck looked like yours. Maybe with a string of lights it might start to take shape. I LOVE THESE LIGHTS! I would also use them in my deck! The Vintage lights are FUN !! our deck… the Vintage lights would be awesome. a definite ‘must have’ !! I’d put these lights along the inside of my screened porch. It would be so relaxing to sit out there in the evenings. I would hang these on the awning of our camp trailer. I love these lights!! If I had a set, I would hang them under the porch railing like you did. What a great idea! I would give them to my daughter for her birthday. She saw some and said she wished they could afford them. Your deck is beautiful! The lights are icing on the cake. I’d love to hang them from our pergola. I’m fairly new to your blog–I LOVE IT! Thanks for the chance to win the lights. We too are a family of redheads. I would love to have these connected from my home to a raw cedar post I have been saving just for that. My house was built in 1955 and I just got electrical outlets installed outside! No more cords running from inside the house! Thank you for the chance to win the string of vintage lights! If I should win, I would string them above and in our lovely maple tree that we sometimes sit under by our little table there. It would be even more lovely! I love this style of lights. I would use them in my courtyard to add additional lightening. Hello to my Favourite Redhead on the internet, I hope all of you are having a wonderful and safe summer. A quick question, if you have the time. Why are Canadian residents so rarely allowed to enter the USA giveaways I see that a few people offer to their blog readers? Thank you for a very pretty blog for me to dream over. Due to shipping costs. Thank you, Linda! Awesome lights and I love the way you hung them. I have a gazebo in my back yard that would love to be the new home for a set of these lights. Thanks. Enjoy all of your posts. 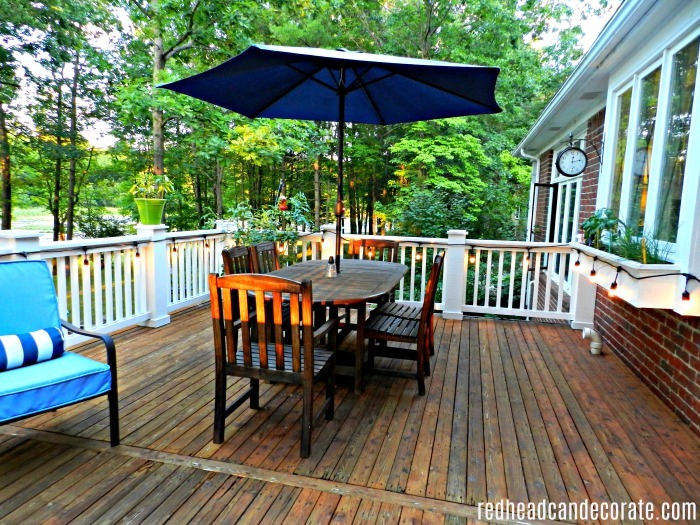 Your deck looks so cozy! 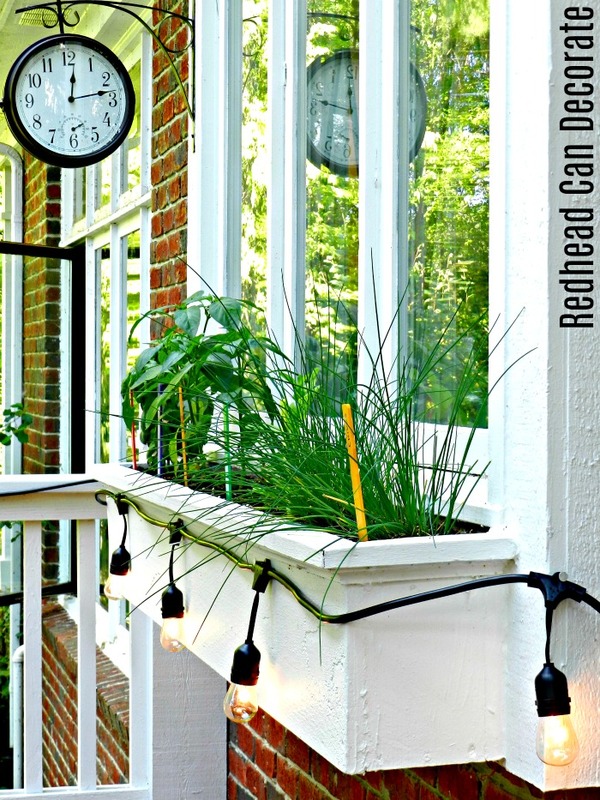 I love how you hung them under your railing, I am going to do the same on the deck off our master bedroom! It will give us ambient light inside and out… AND on our pool deck below- pinning, sharing, and checking out the website, enter me to win! Yay, a game! I love these sturdy lights and have always wanted some! We moved to a new home 2 years ago and the interior updates are almost complete. 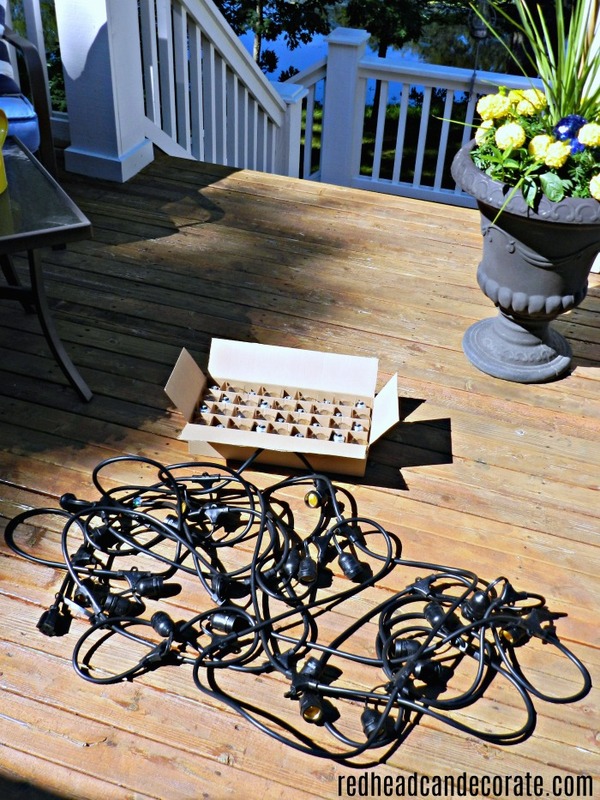 The patio is one of our next projects….these lights would be the icing on the cake! Thanks for sharing! Those lights are fantastic. I would love to have a set to light up my back porch! At the present, I’m unable to use it after dusk. Your new lights look great! I can see why you were so anxious to get them up; and the lower level is really clever. I like it a lot. If I had these lights I would definetly replace the old c7 Christmas lights that hang over our patio. LOL and I do mean ‘old’. Thanks for your blog Julie. This would be the perfect solution for my back yard dilemma. I used to have low-voltage lighting everywhere, but over the years the lights have broken, the low voltage wire has worn and the transformers have gone kaput. Low voltage parts are so expensive now and I just don’t have the energy to re-do the whole system. String lights around the deck will be cheery and festive and I can put them on a timer to come on and go off when I want. These lights are fantastic!! Would love to add them to our covered patio! They would be perfect! Thanks for the chance to win! As much as I ❤️ love the way you mounted those beautiful lights, I would put these up around our new fire pit patterned after yours!! I have looked at lights like these recently and really like them. Up to this point I’ve been a white twinkle light girl…Love those on the summer porch! Hope I win after I do the steps.Thanks for sharing your lovely home! I just built a fire pit area for my teenagers. I would string them overhead. I just moved into a new place and have been fixing up a “secret garden” in the back. These would be perfect for the mood lighting! Those lights are epic. My deck not only wants but needs them. Would love to win. I think these are magnificent! I would use them on the back porch. I like your idea of mounting them kind of low – then the light would not be in our eyes as we sit and visit! Thanks for all the work you do on your blog!! It looks beautiful and festive, not to mention your lovely blue seating and fun blue striped pillows! You have really good taste! Another great idea from the BRIGHT Redhead! Nostalgia lights are beautiful attached on lower rails! A great tip to share with my daughter, neighbors & friends. Daughter has a deck that would look stunning with this idea! I usually pass on your clever ideas & you cease to amaze me! We just spent most of the Summer having the front porch of our house,which was 128 yrs old, last week, rebuilt! These lights would be so beautiful around the ceiling!! !They would look just perfect with our ‘haint’ blue ceiling! ? Thanks! Oh these are beautiful and would look lovely in my daughter’s room. We recently redecorated her room and she went with the Love/Peace idea but it turned out more vintage than anything. Thanks for sharing this give away with us. Good luck to everyone.. These are exactly what we were looking for to light up our back yard for Josh’s grad party! I can’t believe you posted in your blog about them right when I was checking time out online! You did an amazing job displaying them on your deck! I would put them around my new patio! I have always wanted a porch to sit and relax, as you said and sip ice tea, watch the birds at our feeders and just enjoy our time together. The problem was, we didn’t have a porch and the front of our house, being split foyer, we weren’t able to afford what it would cost to add a porch. But, we do have a deck around the back of our home and we got some young men who did odd jobs to build a porch…I guess you would say cover over a section of our deck. It’s very simply done, framed out and they used tin for our roof. We are enjoying it so much. So when it’s hot, we are shaded, when it rains, we sit and listen to the rain on our tin roof! We have been talking about lighting and what we should do. So having these beautiful lights would take are of that. I love those type of lights and loved the under hang idea. They look so pretty on your deck, which is so beautiful! So here’s hoping! Thanks for giving your readers/fans this opportunity! The lights just add another beautiful element to your deck and completely understand how excited you were about putting them up. They would look great hung around the pergola on our patio. We have a random beam outside our back door that we want to hang lights to to create a fun lighted patio. Actually, I’d do something similar to what you did, if I’m lucky enough to win. We did some work on our deck last summer – taking off old wooden floorboards and replacing them with composite boards. This summer we bought a really nice outdoor dining set (to replace a really cheap, plastic set we’ve had for years). So, now it’s time to add some fun accessories, like lights and colorful throw pillows. These lights would look fantastic on our back patio and will “light up the sky” here in Oklahoma. Love your home! i really like thelight set. i think i would hang them around my carport. even though i have two booger lights and two porch lights it is still dark under there. i really like what you did though. Love these lights. They are a great addition to your deck. I LOVE these lights. My future daughter-in-law gave me a set that look like these but are for in-doors that I have in my camper. I would love a set for outdoors to put around our back porch and/or deck. Thanks for the link to this amazing company! I have a chandelier with Edison bulbs over my kitchen island. I LOVE it! After poking around Nostalgic Bulbs .comI am so looking into getting some LED filament bulbs! Your deck looks amazing! I would love to use the strand of lights to hang around our fire pit out by the deck. Would have to get the hubs to set some posts to get them hung. One more incentive to get that checked off the honey do list! 😉 My teenage daughter and her friends would be thrilled for these! Bring on the summer night bonfire hang outs!! I have been looking for lights to put in my backyard and have never seen anything as beautiful as these. I love the style and the fact that they look so sturdy and will hold up to the elements. I love these. They’d go great in my backyard patio by the pool!! First off your deck looks amazing (and) the lights add that spectacular glow to an already breathtaking view of your woodsy grounds. Truly dreamy Julie great work! Know exactly where I would place these lights. We have a secret garden running the length of our home that needs an update from solar! I have been looking for an outdoor project for my retired husband to do this summer. Ha! Ha! He prefers to work outdoors (even in 92 degree weather). We would place them on our screened in porch. Thank you for sharing your many talents with us. I look forward to your next project. Love these lights! They would add so much ambiance to our gazebo! Lovely! They will be perfect in the new screened porch. I have a pergola attached to the house on the back deck with wisteria hanging completely over it. I would hang the lights on the pergola…I bet it would look amazing with the soft warm glow! Would love these lights! I would hang them on my covered patio! The perfect glow for any outdoor gathering. Hi Julie! Love your deck! If I had these lights I would do just what you have done. We live on a lake and our back porch is my favorite room ? These lights would be the perfect finishing touch! Thanks for your blog. I save many ideas. As a fellow red head, Id love to decorate with these. I have a new home that I am trying to cozy up and the backyard has been neglected so far. With a hot tub on the back patio, I would love to have some swanky string lights like these run along the fence line to brighten things up. It would also help spot possums and the like if they manage to get into the yard again, since our house shares a fence line with a farm. I have large decks and a screen porch down 2 sides of my house. These would look gorgeous there! I love these! I would put them on the porch of our new home. These lights are beautiful. I would use them around our patio and our neighbors will be jealous. Woo hoo, I love these lights and hell, I’ll bet I could totally transform my walk-in (way too deep) closet into a totally gorgeous girly dressing room space with these lights! Everybody has/had the crystal chandeliers, but I’ve got a xlong closet space that needs more lighting, and general pretty accessorizing to become totally awesome! We couldn’t wait for summer to get here so we could decorate our front porch! It turned out so Oo-la-la, comfy and cozy! These lights would be the finishing touch that we’ve been looking for! Come on over for some ice tea! My last comment didn’t have my correct email address- sorry! You’re still invited over for iced tea! Love these lights! Our screened porch has little Christmas twinkle lights hanging from the rafters- not quite the look I was going for- but these lights are perfect! I would love these lights on the portico my fiance’ is building for us. They would be great for entertaining. I would hang them on front porch. We love to sit out there in our rocking chairs. Love the lights. Really need at least 3 sets! One for the patio, for the front porch, and for the RV. Love the vintage look. They appear to really add a lot of soft light for night entertaining. I would do exactly what you did. It’s so pretty and inviting! I just love it and would never thought to put them under the railing! You’re so smart. I really love the Outdoor Patio selections! I teach a Saturday Bible study class for my friend’s children and grandchildren. During the summer months here in Tennessee, I’ve switch the classes to Saturday evenings so the children can have class on the deck and enjoy some play outside. These lights would be a wonderful addition to my deck as my friends pick up their “packages” later, and later! LOL! Love the bulbs! I would use them in screened in porch that overlooks where muy neighbor’s horse are kept. Beautiful view, beautiful lights, cozy place to relax or party. These lights are so fun! We would use these on our deck! We entertain a lot as well as cook pretty much everything outside and these would look awesome! I have wanted lights like these. They look awesome and I love how you did them on the railing. I have also gone to the bulbs website and have pinned. Your deck is absolutely amazing. We have a fishing camp that we visit twice a month. I have the perfect spot on our screened in porch for a set of lights. So please pick me and I’ll get started immediately. I would string them along the patio area out back. Those are gorgeous! I would put them on my fence around the pool. Would be so pretty at night! We are having our 25 year old deck rebuilt soon,(next month hopefully) and adding a pergola. I would love to light up our pergola with these lovely Edison light sublet string! If I were to win these lovley lights, I would put them above my swim spa, on the deck we are building! What a wonderful addition they will be! I would put these around my back patio to give a nice glow so we can sit out there and not be in the dark! They are beautiful and would add such a vintage charm to our 1901 house! For the past 5 years my hubby & I have been renovating a 125+ year old farmhouse/cottage in WV that has been in my family since the early 1890s. It has entailed stripping away approximately 50-60 years of a hodge-podge of “modern improvements” & returning the house to a gentler, quainter, slower paced time. It has been a long Labor of Love but we now have finally reached a point where we can move in permanently. These Edison bulb lights would be absolutely perfect on our big, old front porch or strung through the trees along our entry path!! I have an edison light in my kitchen over the sink and it looks amazing so I know if I won these I would continue that look outside on the deck and it would be amazing! I would string these great lights around my patio. Perfect for nighttime entertaining and cook-outs. It’s gorgeous! Thanks so much for the idea of placing the lights lower at the deck rails. I’ve always wanted lights on our front deck , this placement is perfect! I would hang them on my own very dark patio and be eternally grateful!! So pretty! 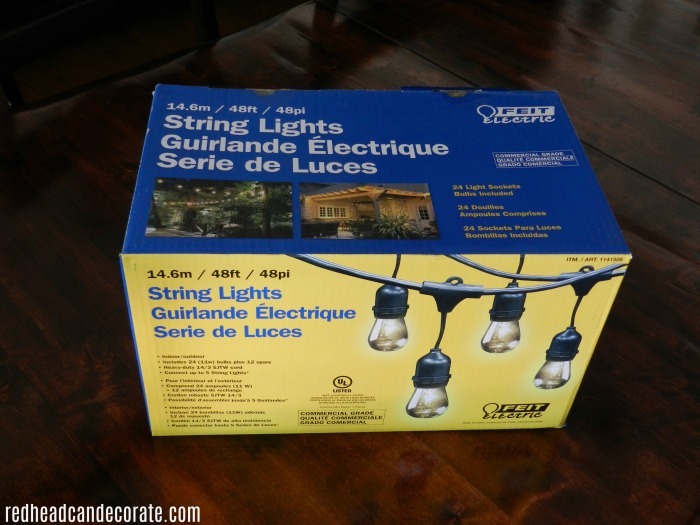 I’ve been thinking about stringing lights from our patio out over the pool, and these would be lovely! I enjoy your blog and all the wonderful inspiration! I would love these on my deck! Oh wow! These lights are pretty awesome! I would use them to perk up my gazebo. Last year we put up a small black iron fence around it to keep the dogs out and make it more beautiful. We put up a few of those post/pathway lights but it just doesn’t “do it” for me. Stringing up these lights along the fence would really turn it around! 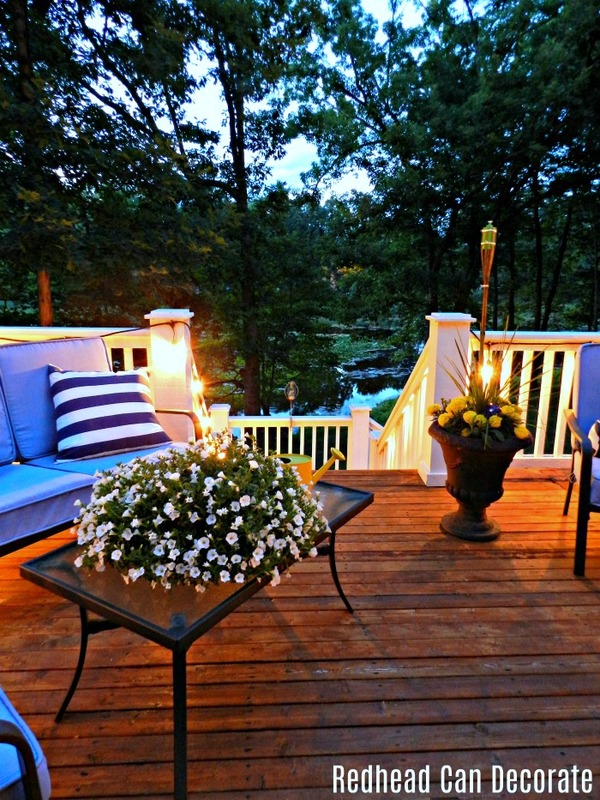 What a gorgeous deck…I love your blue cushions. I would be blessed if I won your generous giveaway. Thank you for a chance to win a set. My daughter in luv’s birthday is in August and I would love giving her the lights. She loves outdoor lighting. 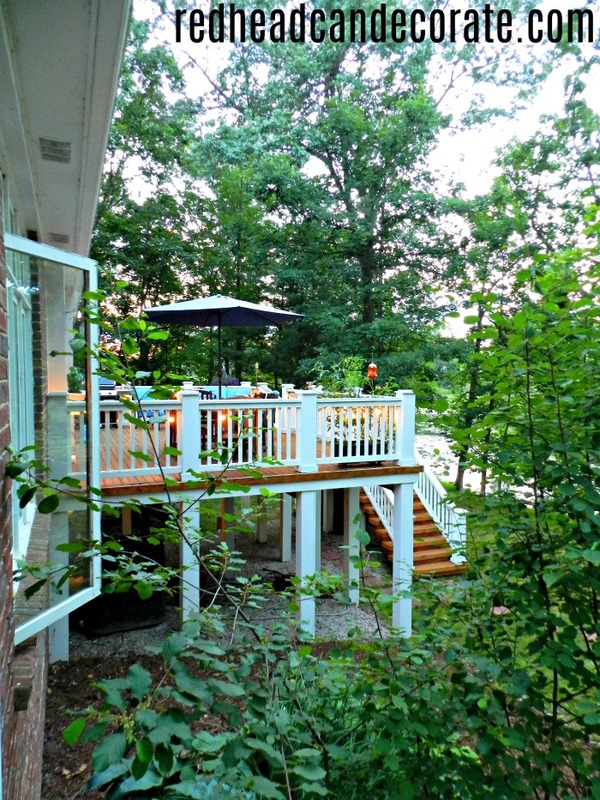 I would line the under side of my deck and create a cozy seating area for cool evenings. I would use these lights on my deck no lights of any kind out there. I have the world’s ugliest porch/patio/back yard ensemble. It is a tragedy, really. We live in a 70s split-level house, so upstairs there is a set of sliding glass doors that lead out onto the rickitiest porch ever. If any sort of building official were to stumble by our house, he or she would immediately condemn it. Seriously, y’all. I feel shame. Below is a weirdly arranged paving rock formation that serves as a patio. It’s odd and it’s uneven and when the imaginary building official was walking away from the condemned porch, he or she would shake his or her head and feel pity for us. Our grill doesn’t work. Our fire pit is crumbling. Our “patio furniture” is bag chairs. I would use my lights to spur a Revolution of Design for that area. I would shake my winnings at my husband and demand action. It would be epic and I would credit you and Nostalgic Bulbs for changing my life. I have a wonderful side porch that’s scremming for these cool lights! We spend so many evenings on the porch so what a wonderful addition these lights would make. We have a darling screened porch and a pergola which is in dire need of lighting. We would be so blessed to receive such a present from you. Thanks for considering any one of us! I love the nostalgic light set you purchased for around your deck. It makes it look so festive. I sure would like to be one of your winners. These would be a wonderful addition to light up the new canopy we put on our deck. Even if I don’t win a set I will consider buying a set! Hi Julie! Your deck is fabulous! The vintage lights add such a cozy, serene feel! I’ve been looking for something like this and I’m so happy to have stumbled across this new to me brand. ; ) I think the bulbs are so pretty and give just the right amount of light. I’d put these outside on our patio until next year when we remodel this space. I’m planning on a pergola and wouldn’t these look wonderful hanging from one? Our family eats dinner on our patio every night we can and usually late due to kid activities, the vintage lights would will be perfect!! Enjoy your beautiful space and thanks for sharing! I love these lights. I’m having my smell front porch screened-in & these lights would be perfect to hang overhead! I love the vintage lights and would use them on our deck…to make it cozy! I would hang them on the new deck. Love the lights I would add them to my little gazebo over my grill they would be perfect I love your deck looks awesome. I would hang them up in our backyard. I would put them outside or inside at my first apartment or house that I am searching for now. Your deck is looking gorgeous with all these lightings. You decorated your deck beautifully. These lights are so cute. We do a lot of outdoor entertaining and these would be so great to have. Just got back form my cottage in Wisconsin and hope I’m not too late. I would attach these beautiful lights around the new arbor that my kids and hubbie made for my birthday a few weeks ago. It sits right next to my DIY bench that I made out of my old fence.. Would create such a charming look. Thanks so much. I would put these around my screened in porch. Wow dude! These lights are super duper awesome. I would love these for our new home. I love these! We just ripped out our deck and did a beautiful patio with a permanent pavilion-type covering. I’d hang these around that! I would hang them in my back yard over our new fire pit. Love the vintage look. My husband just finished building me a deck that goes halfway around my house and these Vintage Style String Lights would look beautiful at night around it! Those awesome lights I would either use them in my store or outside & use them around my Big BEYOND WORD store sign! These lights would look great on our deck. These lights would be the perfect start to my deck redo! Thanks for showing me this, Lisa Christine! I would hang these on my backyard above my daughters fairy garden in the tree branches!!! I would love these on my front porch. They are sooo pretty. Thank you for the chance!!! I love them. Love the atmosphere these lights create. I’d use them to make my back yard a more appealing place to spend time in the evenings. Wow! They’re so beautiful. I would use them on the terrace of my apartment. I have been looking for the perfect set of lights to decorate the terrace. These lights would look fabulous on our back deck. It would be great for the summer evenings. This redhead would use these lights on every backyard porch and fenceline at every Army housing we will live. Its allows up to us Army wives to come up with decorating ideas to “HOMEY” up a house when we will only live there no more than 3 years. And we love cooking out and inviting other Amry Families and Soldiers over for a home cooked meal. And those lights would make it cozy and special. These are gorgeous lights. If I won, I’d use them on our porch. I thing these lights would look wonderful on the lower branches of the oak tree in my front yard! I would hang them along my stairs leading up to the front door. I would string them up above my patio. Pretty cool giveaway! I would drape them close to the ceiling (painted “haint blue”) in my back porch and use them all year long. Thanks for the opportunity! I would hang them on the back patio, to illuminate all my vintage watering cans, garden tools and show off my flower displays on our french flower cart. I would love to win these! I’d hang them off the top of our swing…Thank you for this opportunity! Would love them for my deck! I would love to hang these under the front eaves in my home. These lights would be perfect on my covered porch. I am a retiree on a budget, and I just recently decorated my porch for $44. Two wicker chairs ($30 on line). A $10 thrift store “potting table, and a $4 side table completed the look. The lights would be a perfect finishing touch!! We have a small balcony porch that these would be perfect to use! Love love love these lights! I am refinishing a Tiny House On Wheels a want to build a small patio/deck using recycled pallets. These beautiful patio lights would add the PERFECT finish to my patio! BTW, I also love your blog Julie! I visited the site as well. Thanks for the chance!!! I would hang them from my pergola. It would add so much to my deck at night. I would plant white flower around the pergola to help with illuminating my deck area. These would be so magical on my deck! I have been dreaming about how I would decorate it and these would be perfect. Thanks for the giveaway. In our backyard, we have an above ground pool and a firepit. With my daughter being 11 she loves having friends over to use them. I would love to put these around them for at night when the kids are out there. I love these!!! theyd look great on our patio. I would hang these on our deck!! I’d love to win these lights, If I did I would put them on my pergola for a romantic nighttime glow. I would definitly put these out on our backyard patio!! They’re beautiful. I would put them on my deck. I love these! I would use them on my deck leading out to the pool. I loved looking at all the onews on their website! I have a fall birthday to plan for. We are hosting it outside. I would plan on using these on the back deck. we brought a fixer upper last October, after finally finishing the inside it is now time to work on the outside. We have built a new glorious deck and the PATIO VINTAGE STYLE STRING LIGHTS would be a wonderful addition to our new deck/patio, making for an inviting entertaining area. These lights are soo pretty and I would use them in my back porch since there’s not enough light out there. They would look great! These look awesome – I’m redoing my balcony, so that’s where I’d put them. I shared this giveaway on my Facebook page with my friends. I would love to decorate my back deck with these. Thanks for the chance to win. I would give these to my daughter to help brighten up her apartment. I would use these for our back porch, 1 year ago I would of used them for my wedding but I had a hard time finding something like this. I love them. Yeah, this is a great idea for added safety and security. I would love these lights for my deck. I would put these outside on my front deck. They would look beautiful! Hello my friend, I am sure you been wondering what happen to me? I went out of town on vacation for two weeks. Unable to view my email, I am so so behind. Trying to catchup. I love these strings of lights, as alway, everything you do is fabulous. I’ve been trying to keep an eye out for these type of lights to go on sale. I love the way you hung yours on your deck. They are hung with so much class, that they are gorgeous both day and night time. BEAUTIFUL! Hello, Ivory!! Thank you, and I hear you. Catching up is hard!! Enjoy the last 2 weeks of beautiful August! !